A dam break wave caused by the discontinuity in depth and velocity of a flow is resulted from instantaneous release a body of water from a channel and classified naturally as a rapidly varied unsteady flow. Due to its nature, it is hard to be accurately represented by analytical models. The aim of this study is to establish the modelling differences and complexity echelons between analytically simulated explicit laminar and turbulent dry bed dam break wave free surface profiles. An in-depth solution to the free surface profile has been provided and evaluated by representing the reported dam break flow measurements at various locations. The methodology adopted utilizes the free surface profile formulations presented by Chanson1,2, which are developed using the method of characteristics. In order to validate the results of the presented analytical models in illustrating the dam break wave under dry bed conditions, published experimental data provided by Schoklitsch3, Debiane4 and Dressler5 are used to compare and analyze the performance of the dam break waves under laminar and turbulent flow conditions. Fluid flows are categorized respectively, according to the nature of their flow. Any fluid flow in which the fluid particles follow a smooth path, never interfering with one another and when the fluid velocity is constant at any given point is referred to as laminar flow. Understandably, any fluid flow in which the fluid particles follow an irregular and arbitrary path referred to as turbulent flow. In order to differentiate between the two, the dimensionless quantity referred to as Reynolds Number (Re) was developed, in which any fluid flow exhibiting a low Reynolds Number (less than 2300) is classified as a laminar flow, whilst any flow exhibiting a high Reynolds Number (greater than 4000) is classified as a turbulent flow. A flow experiencing a Reynolds Number between the two are classified as transitional flow. The Reynolds Number adopted in this study will represent the fluid properties of a reservoir flow, and hence is derived slightly different compared to the standard Reynolds Number and is herein referred to as ‘reservoir flow Reynolds Number’ (R), refer to its usage in Chanson1,2. This study will explicitly develop an analytical free surface profile using both laminar and turbulent dam break wave concepts to identify their respective effect to dam break flow. The solutions originally developed via the Saint Venant approach, presented a simplified approach due to the neglecting the frictional factor and turbulence. A study conducted by Dressler9 provided evidence that accounting for the frictional and turbulent resistive effects by incorporating hydraulic resistances terms in the form of the Chezy function within the dam break flow governing equations produced highly complex equations that have no exact solution till present. During the initial stages of dam break wave as the flow propagates, the ideal fluid flow region simultaneously develops backwards (by depression wave), upstream (positive bore) in the reservoir flow region. At downstream, the front wave propagates due to the strong downward vertical acceleration of the fluid released. The dam break wave propagates with velocity decreases steadily due to the large resistance coefficient; hence the wave tip region develops rapidly as the wave tip velocity reduces. This reflects the inverse affiliation between time and the resistance coefficient. Additionally, the wave tip region is significantly complex to uphold due to the flow velocity condition in which the velocity must be uniformly distributed through-out the wave tip region. Deng et al.,10 stated the dam break simulation’s crucial fundamentals rely on the estimation of wave tip region, which aligns with the results they achieved. The transitional phase into frictionally dominated in the wave front region in which a flow singularity by zero-water depth occurs, can consequently result in an explicitly unstable analytical solution of the dam break wave tip. The transitional interface connecting the main flow region and wave tip region is usually assumed in literatures to be first located in forward manner, then in backward towards upstream. Aligning with the studies of Ritter11 and Chanson1,2 the resistant coefficient was assigned with value zero just before the wave front starts (x<x1).Their computations are derived from the momentum and continuity equations, followed respectively by their forward and backward characteristics (method of characteristics) to establish the relationship between time and velocity of the wave tip. Considered frictional resistance within the wave tip region, their calculation results of the water depth at the transitional interface increases over time. In this study, the method of characteristics will be used to form the laminar and turbulent models for dam break wave, due to they are well-tested in Chanson1,2. Comparison of the presented laminar and turbulent models with published experimental data will also be used to validate the models. During a laminar dam break wave the ideal fluid flow field yields the following basic equations. It is noted that the influencing factor of the wave tip region is not the flow velocity but the wave front celerity, as confirmed by the experimental studies of Whitham12. Assuming that the flow resistance is dominant, and that both the inertial properties and velocity of the flow are negligible, then the momentum equation can be reduced into the diffusive wave equation. The transition between the ideal fluid flow region and the wave tip region yields two relationships, i.e. for the free-surface and velocity profiles, in which both must be continuous. Equation (8) gives the dimensionless wave front location dependent on both the dimensionless time and wave front celerity. Due to this the entire free surface profile equation must satisfy conditions set up by equations (9) – (12), where outlined at Figure 1. Figure 1 Illustration of the Laminar Flow Regions with their Corresponding Solutions. The continuity of the flow properties during the transition between the ideal fluid and wave tip regions is preserved. Hence, the integration of the continuity equation yields the analytical solution below within the context of dimensionless wave front celerity. The wave front location is illustrated through equation (16) below, and Figure 2 demonstrates the full flow profile in the presented turbulent model. Figure 2 Illustrations of the Turbulent Flow Regions with their Corresponding Solutions. The laminar flow conditions usually used in the published analytical models to reflect flow condition in a large reservoir during the propagation of the dam break wave. 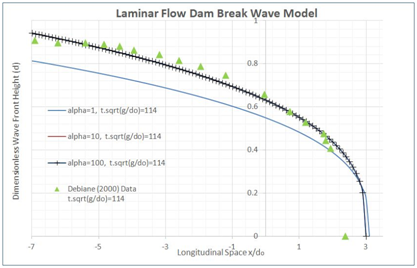 To validate the proposed laminar model, this study is concentrated to the in-depth detailed measured data within dam break region to validate its dam break wave computation. In Figure 3 the results of laminar dam break wave model show a positive correlation to the published data. The analytically explicit free-surface profile solutions produces results illustrating accurate the wave front shape as referencing to the measured data provided by Debiane4. Also worth noting that different modelling results by various dimensionless velocities are presented in the figure, but make no obvious difference to computed results. 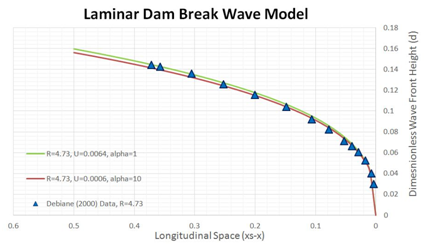 Figure 3 Laminar Dam Break Wave Model versus Debiane4 Measured Data. Debiane4 also measured a set of data from their experimental study, which utilized the dimensionless reservoir flow Reynolds Number ‘R’ coefficient as 0.671 and the dimensionless time ‘t’ as 114. In Figure 4 comparison to Debiane4 data, the dimensionless ‘ x t ' MathType@MTEF@5@5@+= feaagKart1ev2aaatCvAUfeBSjuyZL2yd9gzLbvyNv2CaerbuLwBLn hiov2DGi1BTfMBaeXatLxBI9gBaerbd9wDYLwzYbItLDharqqtubsr 4rNCHbGeaGqkY=gjVeeu0dXdPqFfpec8Eeeu0xXdbba9frFj0=OqFf ea0dXdd9vqaq=JfrVkFHe9pgea0dXdar=Jb9hs0dXdbPYxe9vr0=vr 0=vqpWqaaeaabiGaciaacaqabeaadaqaaqaaaOqaaabaaaaaaaaape WaaSaaa8aabaacbmWdbiaa=Hhaa8aabaWdbiaa=rhaaaGaaiiOaiaa cEcaaaa@3A7D@ is captured within −7≤ x t ≤ MathType@MTEF@5@5@+= feaagKart1ev2aaatCvAUfeBSjuyZL2yd9gzLbvyNv2CaerbuLwBLn hiov2DGi1BTfMBaeXatLxBI9gBaerbd9wDYLwzYbItLDharqqtubsr 4rNCHbGeaGqkY=gjVeeu0dXdPqFfpec8Eeeu0xXdbba9frFj0=OqFf ea0dXdd9vqaq=JfrVkFHe9pgea0dXdar=Jb9hs0dXdbPYxe9vr0=vr 0=vqpWqaaeaabiGaciaacaqabeaadaqaaqaaaOqaaabaaaaaaaaape GaeyOeI0IaaG4naiabgsMiJoaalaaapaqaa8qacaWG4baapaqaa8qa caWG0baaaiabgsMiJkaacckacaGGGcaaaa@400A@ 3.1 due to majority of the wave propagation occurring in this segment during the experiment. The uniform flow velocity recorded by Debiane4 was 0.672m/s. Reflected in equations (4),(5) and (11) it can be observed that in order to estimate the wave front analytically a reduction factor ‘α’ MathType@MTEF@5@5@+= feaagKart1ev2aaatCvAUfeBSjuyZL2yd9gzLbvyNv2CaerbuLwBLn hiov2DGi1BTfMBaeXatLxBI9gBaerbd9wDYLwzYbItLDharqqtubsr 4rNCHbGeaGqkY=gjVeeu0dXdPqFfpec8Eeeu0xXdbba9frFj0=OqFf ea0dXdd9vqaq=JfrVkFHe9pgea0dXdar=Jb9hs0dXdbPYxe9vr0=vr 0=vqpWqaaeaabiGaciaacaqabeaadaqaaqaaaOqaaabaaaaaaaaape GaaiigGiabeg7aHjaacMbiaaa@397E@ is required. The reduction factor has proved to be vital in explicitly computing an accurate free surface profile as presenting at Figure 4 and it was observed that adopting ‘α’ MathType@MTEF@5@5@+= feaagKart1ev2aaatCvAUfeBSjuyZL2yd9gzLbvyNv2CaerbuLwBLn hiov2DGi1BTfMBaeXatLxBI9gBaerbd9wDYLwzYbItLDharqqtubsr 4rNCHbGeaGqkY=gjVeeu0dXdPqFfpec8Eeeu0xXdbba9frFj0=OqFf ea0dXdd9vqaq=JfrVkFHe9pgea0dXdar=Jb9hs0dXdbPYxe9vr0=vr 0=vqpWqaaeaabiGaciaacaqabeaadaqaaqaaaOqaaabaaaaaaaaape GaaiigGiabeg7aHjaacMbiaaa@397E@ as 10 increased the model accuracy significantly. In the figure, one can see that by adopting a reduction factor of 1 highly disturbed the accuracy of the model, while utilizing a reduction factor of 100 posed no significant increase in accuracy in comparison to using a reduction factor of 10. Figure 4Laminar Flow Dam Break Wave Test using Different α MathType@MTEF@5@5@+= feaagKart1ev2aaatCvAUfeBSjuyZL2yd9gzLbvyNv2CaerbuLwBLn hiov2DGi1BTfMBaeXatLxBI9gBaerbd9wDYLwzYbItLDharqqtubsr 4rNCHbGeaGqkY=gjVeeu0dXdPqFfpec8Eeeu0xXdbba9frFj0=OqFf ea0dXdd9vqaq=JfrVkFHe9pgea0dXdar=Jb9hs0dXdbPYxe9vr0=vr 0=vqpWqaaeaabiGaciaacaqabeaadaqaaqaaaOqaaiabeg7aHbaa@37E5@ Reduction Factor. In Figure 5 and Figure 6, the presented model shows a positive correlation with the reported experimental data. The results indicate that the model is dependent on the frictional factor and relative roughness. At the wave tip region located between the wave front start (x1) and the wave front end (xs), the inertia acceleration terms are significantly mynute and hence dominated by the flow resistance. Figure 5 illustrates the modelling results computed against the Schoklitsch3 data, which indicated the final wave front location and ideal fluid region is in agreement with published data. It is important to note that the reservoir flow Reynolds Number R was taken as 63000. Dressler9 further carried out another experiment, in which the results illustrated the difference between the wave front region of the free surface profile with and without a smooth invert. In order to investigate the measured test case by Dressler9, the dimensionless sand roughness height ‘ks’ has been used in the presented model as 0.35, the dimensionless time ‘t’ was taken as 55.6, and the dimensionless reservoir flow Reynolds Number ‘R’ as 340000 (as the same as conditions in Dressler9). The comparison results in Figure 6 shows that the proposed model reproduces the measured turbulent dam break data with good correspondence. 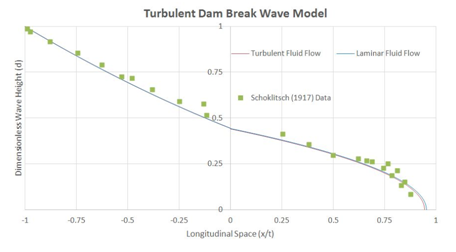 Figure 5 Turbulent Dam Break Wave Model versus Schoklitsch4 Measured Data. 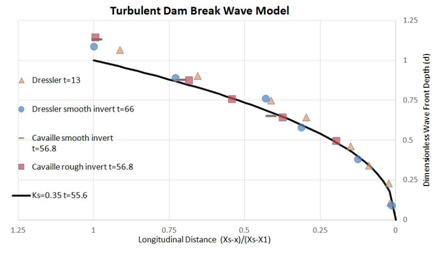 Figure 6 Turbulent Dam Break Wave Model versus Dressler13 Measured Data. Chanson H. A Simple Solution of the Laminar Dam Break Wave. Jounral of Applied Fluid Mechanics. 2008;1(1):1−10. Chanson H. A Simple Solution of the Turbulent Dam Break Wave. Journal of Hydraulic Research. 2009;47(1):41−49. Schoklitsch A. Uber Dammbruchwellen. Sitzungsberichte der k. Akademie de Wissenschanfern. 1917;126(IIA):1489−1514. Debiane J. Hydraulique des Ecoulements Laminaires à Surface Libre dans un Canal pour des Milieux Visqueux ou Viscoplastiques: Régimes Uniformes, Graduellement Varié, et Rupture de Barrage. France: Thèse de l’Université Joseph Fourier, Laboratoire de Rhéologie de Grenoble; 2000. 273p. Dressler RF. Comparison of Theories and Experiments for the Hydraulic Dam Break Wave. International Association of Scientific Hydrology Bulletin. 1954;3(38):319–328. Pu JH. Turbulence modelling of shallow water flows using kolmogorov appriach. Computers and Fluids. 2015;115(12):66−74. Zheng XG, Pu JH, Chen R, et al. A Novel Explicit Implicit Coupled Solution Method of SWE for Long-term River Meandering Process Induced by Dambreak. Journal of Applied Fluid Mechanics. 2016;9:2647−2660. Pu JH, Shao S, Huang Y. Numerical and experimental Turbulence Studies on Shallow Open Channel Flows. Journal of Hydro-environment Research. 2014;8(1):9−19. Dressler RF. Hydraulic Resistance Effect Upon the Dam-Break Functions. Journal of Research of the National Bureau of Standards. 1952;49(3):217−225. Deng X, Liu H, Lu S. Analytical Study of Dam-Break Wave Tip Region. Journal of Hydraulic Engineering. 2018;114(5):04018015. Ritter A. Die Fortpflanzung der Wasserwellen. Vereine Deutscher Ingenieure Zeitswchrift. 1892;36(2):947-954. Whitham GB. The Effects of Hydraulic Resistance in The Dam Break Problem. Proceedings of Royal Society, Series A. 1955;227(1170):399–407. Dressler RF, Pohle FV. Resistance Effects on Hydraulic Instability. Communications on Pure and Applied Mathematics. 1953;6:93−96. Pu JH, Lim SY. Efﬁcient numerical computation and experimental study of temporally long equilibrium scour development around abutment. Enviromental Fluid Mechanics. 2014;14(1):69–86. Stoker J. Water Waves: The Mathematical Theory with Applications. New York: Interscience Publishers; 1957. 609p. ©2018 Taha et al. This is an open access article distributed under the terms of the Creative Commons Attribution License , which permits unrestricted use, distribution, and build upon your work non-commercially.